Sea Dragons are cousins of seahorses, and they are every bit as charming and beguiling as their cousins. 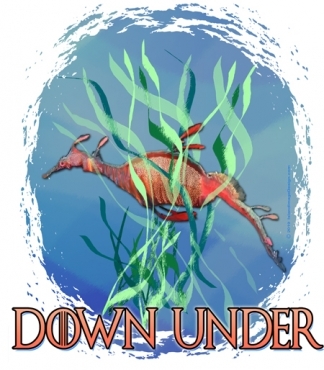 This little guy is a great way to show your devotion to the world 'down under' and is an excellent companion to our seahorse design. Our petroglyph line shows the global nature of petroglyphs from our past, now brought to life in ocean colors. Petroglyphs can be found globally.Some ocean locations: Haiti, Puerto Rico, Dominican Republic, St. Vincent, South American, Hawaii, the Pacific and for that matter, in many desert locations. 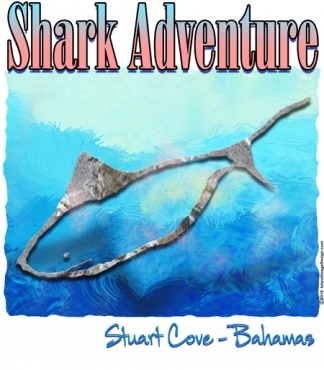 The fish is featured in featured in reef colors and the shark is featured in lava/stone. 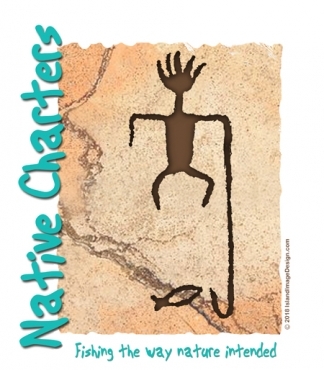 Also check out the Fishing As Nature Intended petroglyph. Another of our petroglyph-inspired designs, this features an ancient fisherman and what appears to be similar to modern-day hand-reel fishing. It is truly fishing as nature intended! 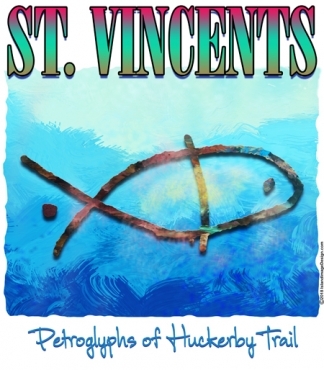 This is fun for any boat-owner, fishing enthusiast or history buff. 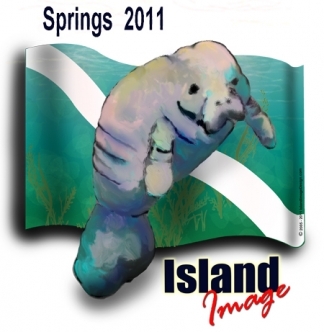 Island Image now offers custom banners and flags. They are high quality, sun and weather tolerant. Ask us about it! The oceans offer us some of the most gorgeous wildlife imaginable, and this triggerfish is one of the showiest. Known as a Reef Triggerfish Humuhumunukanukaapua'a (second name is the Hawaiian version ) it indeed swims softly and carries a big name. This is a relative of the Lagoon Triggerfish, also known as Picasso Fish. This is great for Pacific destinations. As usual, our various citizens of the sea are available in many treatments. Today, we introduce the Queen Triggerfish on our 'Love Diving' heart. Great for trips to the Caribbean, Cuba and Bahamas! 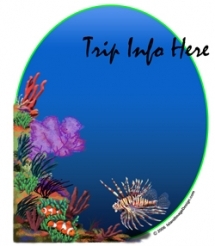 Customizable for your group trip destination. Sea Turtles are all over the planet and are a favorite of ours. They're so gentle and yet, unless you've watched one rip a conch apart underwater, you have no clue how strong they are! I've also sat by when I was a child, as one big girl laid her eggs, and have also seen them hatched. THAT is the reason they're favorites of mine! 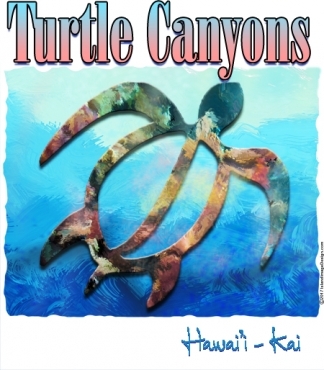 This new Petroglyph-Inspired Honu reminds of us how long these amazing beings have been here on our planet. 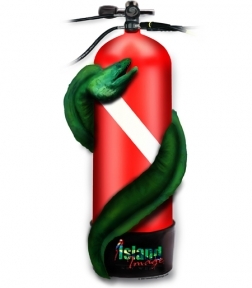 This is a great design for any dive destination. If you've ever been diving on a wall, you'll understand the feeling of vertigo as it goes deeper and deeper. Wear your wall dive on your back! 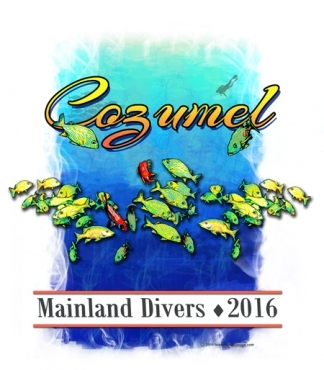 This design adapts well to any number of wall dives in the Caribbean and Pacific, and wording/dates can be changed as you wish. In these horrible days of mass murder, we decided to give TriggerHappy a fresh new meaning! 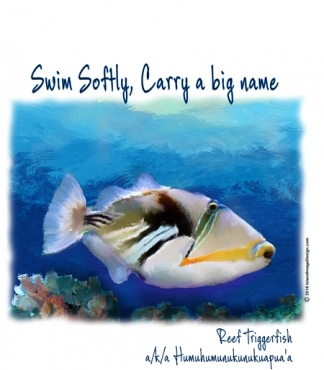 This Queen Triggerfish will work for many destinations and includes part of our reef and water painting as well. Hurricane Irma gave us a bit of unwanted downtime but now, we're back at full speed. 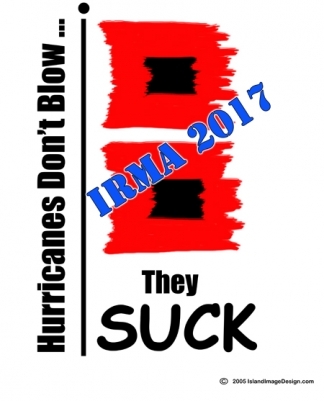 I was even inspired to bring back our classic hurricane designs for those who are in hurricane zones and wish to celebrate their survival. 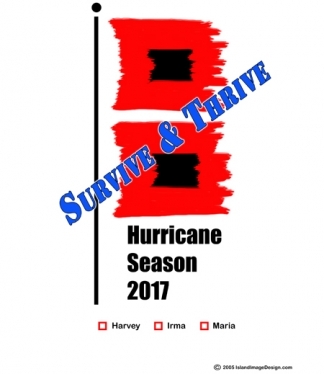 Add your hurricane, your dive shop, event or celebration to this design. 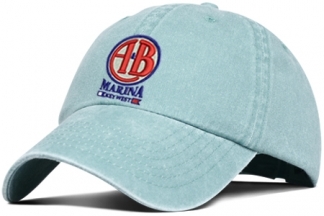 INTRODUCING our new Embroidered Cap line. 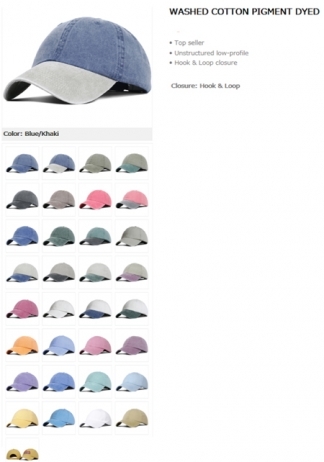 These high-quality 6-panel unconstructed caps are available in 32 colors, so you can mix and match your inventory and be VERY creative! These popular caps feature a Velcro back strap so there is no buckle to rust. We've offered these for some years to our custom yachting customers and of course, they are still available to them. 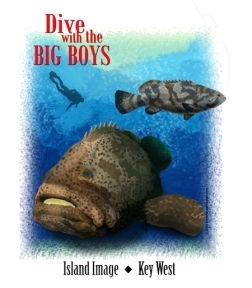 Now we're offering to our dive industry insiders as well. There is no setup charge for digitizing your logo (but there ARE minimums.) 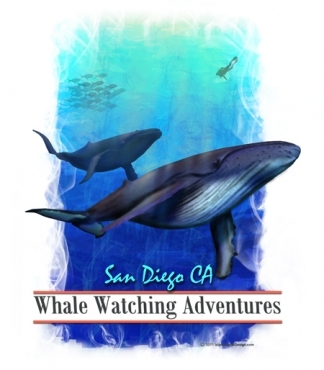 This program is great for retail or for travel groups that love caps, with participants wanting several in different colors. 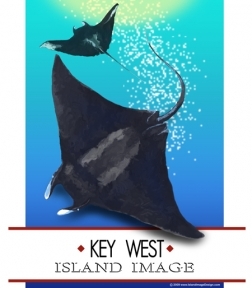 You can view HERE, but will need to phone us (305.295.8061) for details of this program. 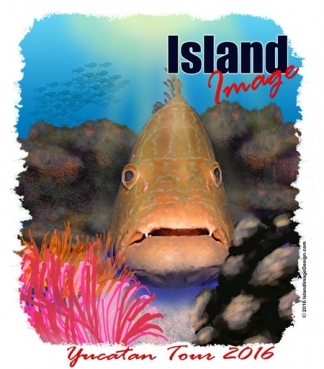 Island Image is your go-to for boating, yachting and dive boat tees! 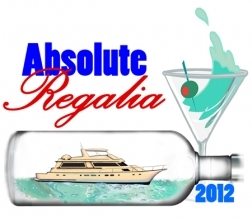 Most of the boat designs are fully custom, produced to order for you and your family and crew. Choose from 100% cotton tees, performance tees with sun protection and cooling wicking properties, as well as ladies designs. Add the captain and crew names to the front, as well as tech, line drawing or a colorful painting of your boat on the back. You can see some of the many designs we've done here on our boating and yachting page. We've been very busy! Introducing yet another series. It is vitally important that we love our planet and we do all we can to help Mother Gaia, and diving with stunning underwater beings helps us all to feel in touch. 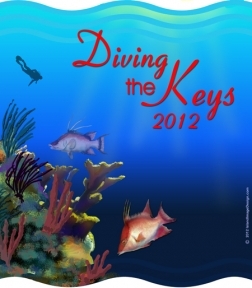 That is the idea behind this "Love Diving" and the "Ethereal Diving" series. 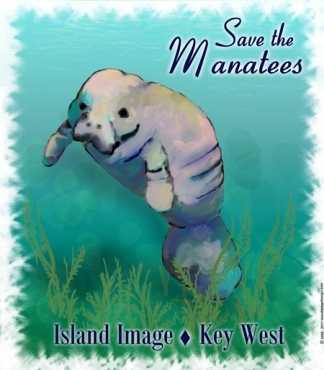 We are doing all we can to focus on these loving creatures and thus, hoping to promote conservation. 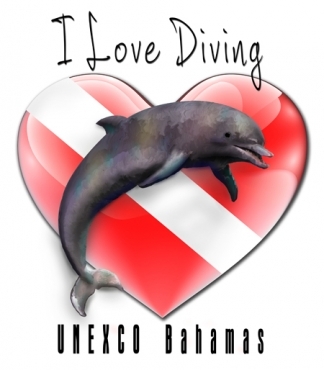 The first of this new "Love Diving" series is of course, our 'Love Diving Dolphin' Dolphins are very close kin to us and promoting their well-being is important to the planet. 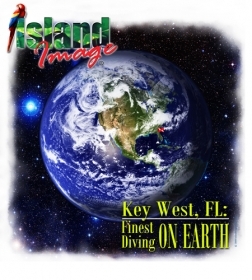 This example features wording "I Love Diving" on top and a destination on the bottom. 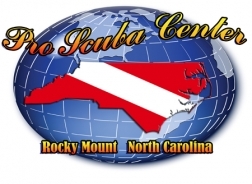 As always, for dive shops, wording can be altered for your trip destination. 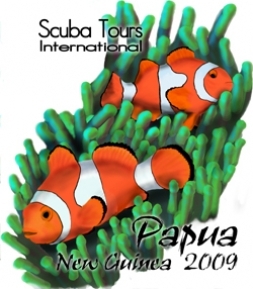 We all know that diving is a surreal experience and our Ethereal designs reflect just that. 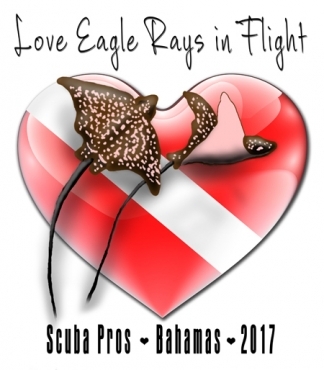 The new Ethereal Eagle Rays dance in a sparkling, softly lit sea. WHAT IS MORE ETHEREAL THAN DOLPHINS? 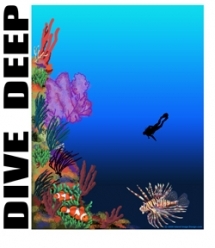 ETHEREAL DIVING SERIES - DIVING SHOULD BE ETHEREAL AND SO SHOULD YOUR SHIRT! 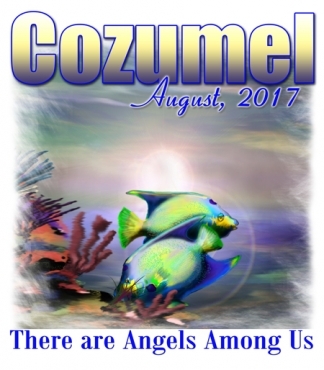 Enjoy an angelic experience underwater and then share it with the world with our new design: Angels Among Us. 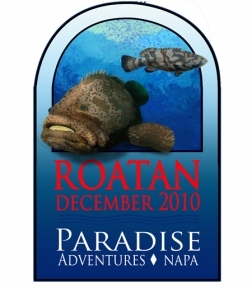 Our Black Grouper is the first of our Faces line. He has obviously just come out of his rocky coral ledge. Customizable for you, your trip, your group or your event, we can add your company name, date, or destination to the design. 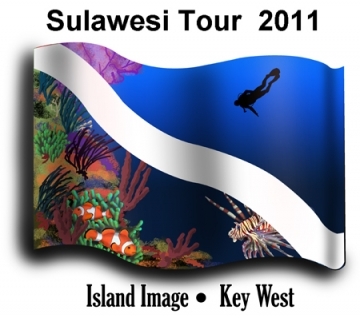 Our underwater friends are featured in two treatments - one in a mystic sea and of course, a dive flag. Enjoy grunts, snapper, squirrelfish and more with these two bright tees. The Mystic Mermaid beckons you to join her under the sea. THE MERMAID IS FINALLY HERE! Add any wording you like - your trip, your shop, your event or your cause or even for your students. 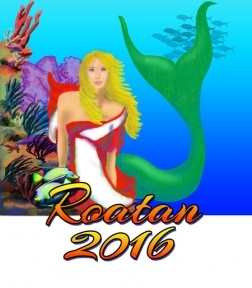 Our Mermaid beckons to those who have yet to discover the mysteries under the sea. 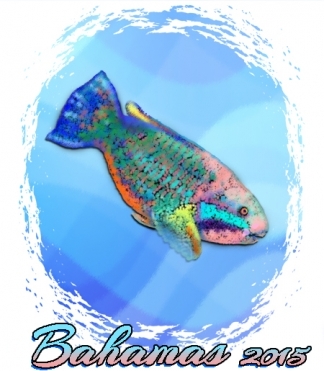 WELCOME OUR PARROTFISH TO THE RAINBOW SEAS COLLECTION! 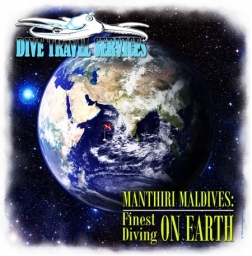 Here's an addition to the Global Diving series. 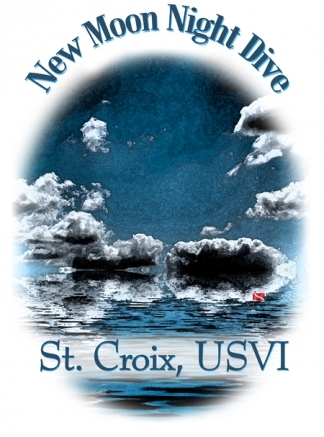 Wisconsin Dive Shops now have a new choice for their staff and student shirts! The new Rainbow Sea Series features some of the most colorful creatures in our magnificent oceans. As always, the designs are customizable. 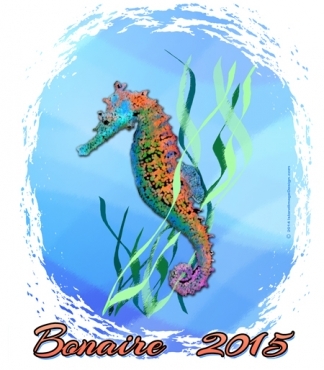 The Rainbow Sea Seahorse is a bright interpretation of all the colors found in seahorses worldwide. Coming soon in the Rainbow Sea series: Parrotfish and Sea Dragons. 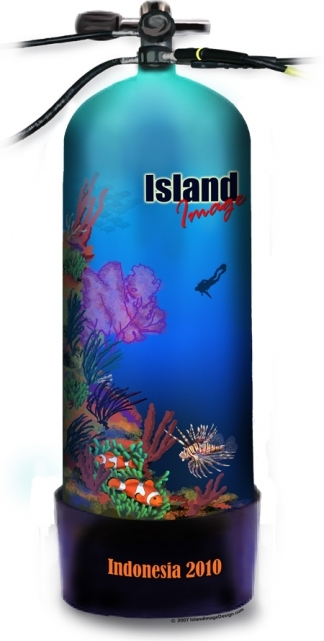 This versatile design is great for dive destinations, staff and for events. You may customize with your shop name and your state. Shown are two - one for Florida and one for South Carolina. The new 'Rope and Sea' design pulls together the elements of diving we all love - dive flag, bubbles and that nautical vibe. 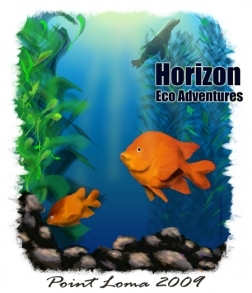 This new design is very workable for liveaboard trips or for any destination that you choose. The new Tropical Sea design is one of the new Flexibility series, which allows you to make it what you want it! This adapts well to any destination or location and features a light-weight tropical vibe. Turn your boat into a fun tee! 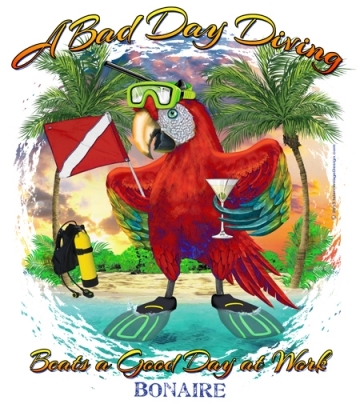 The new addition to the Diving Parrots line reminds us all that a Bad Day Diving is better than a good day at work. This is customizable with your trip, location, shop, date or event. (We have updated this design with new palms, brighter colors). 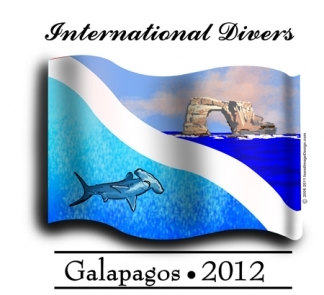 The new Galapagos Dive flag features a hammerhead shark and Darwin's Arch. Simply add your company name and you're good to go! 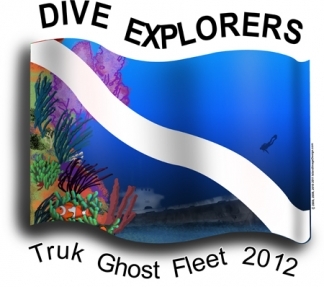 The new Absolute Diving design can be customized for your trip, your liveaboard, your destination. 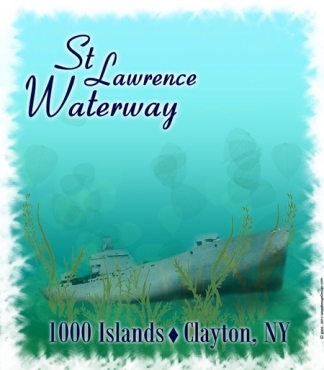 In this example, we used the design for a private yacht. How would you like to use it? Call us to find out how you can build your own design! We're here to help! YOU ASKED FOR HOG FISH, NOW WE HAVE HOGFISH! 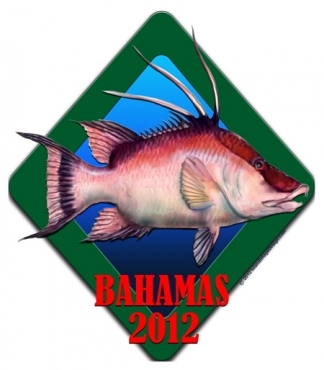 We had requests at DEMA for hogfish designs, so here they are. 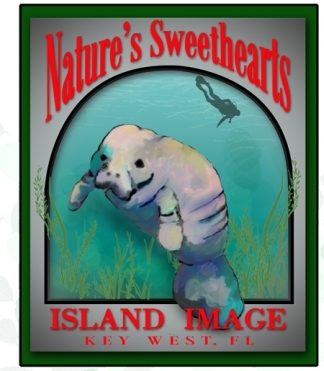 Whether you call them hogfish or hog snapper, our new designs are featured in various design layouts. 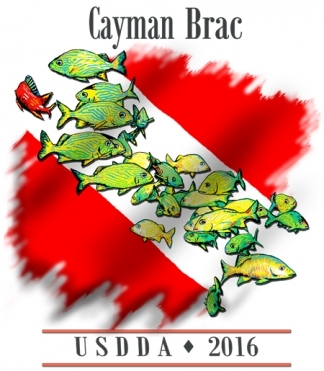 This design is great for the divers who enjoy the hogfish you see on reefs from Bermuda, the Bahamas, the Keys, and all throughout the Caribbean basin to the coast of South America, or for fishermen who enjoy spearfishing. In most cases, we can also pop them into any of our existing designs. 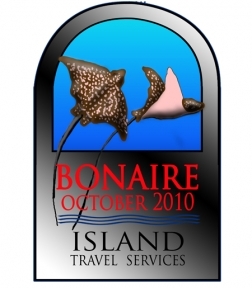 Feature the name of your business or your trip or event by customizing the wording. 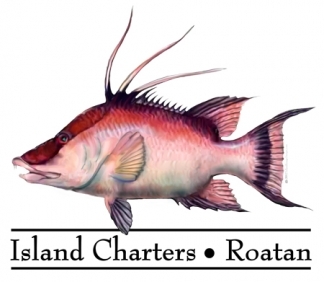 Ask us about adding hogfish to an existing design. CHECK OUT OUR COOL CUDA! 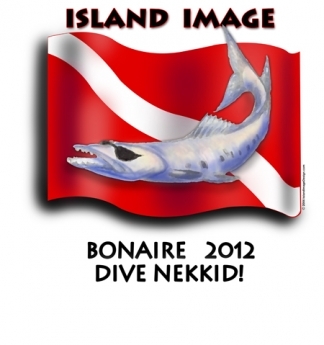 Our old Cool Cuda on Dive Flag is back, and this time, on a dive flag. Now, you can feature your destination or your underwater world through a dive mask. This series has two new designs thus far. Wording can be changed for your destination (based on fit). And this is an Underwater View . Ask about other available 'views'. 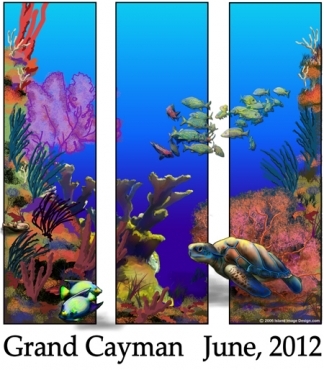 Now, you can bring forward your favorite creatures on our new 'Windows Reef'' design. 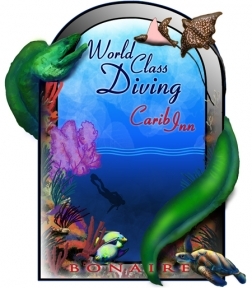 Tell us what you expect to see at your next dive travel destination and we'll find the right 'Windows' design for you! HUMPBACK WHALE DESIGN - GREAT FOR DIVE AND TOUR OPERATORS AS WELL AS ENTHUSIASTS. 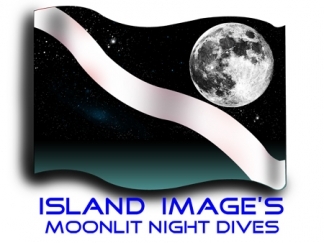 Now that summer is upon us, what better way to enjoy a beautiful summer night than a night dive? 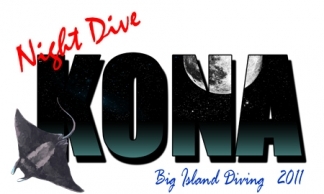 And what better way to celebrate night dives than our new Night Dive designs. Choose on white for a sharp, vivid look or on natural for a soft, vintage look. 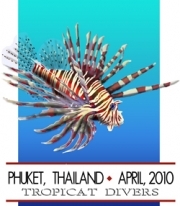 Dive operators, customize with your trips, your location, your URL, your dates and information. 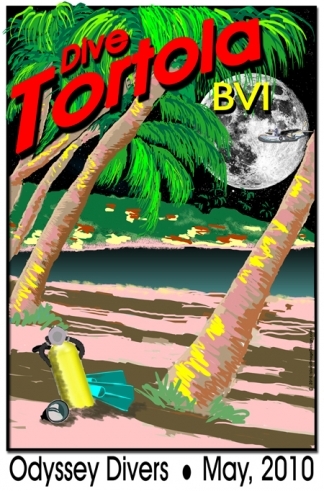 And our Vintage Posters are now available for warm, summer nights, featuring a huge moon, starry skies, vintage dive gear and a seaplane. 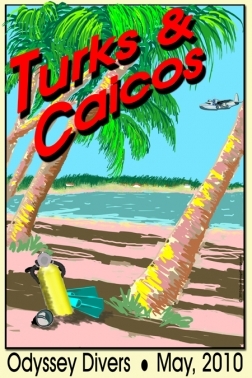 Available for 'flat' island destinations and 'hilly' island destinations. Example of customized version with URL, City and Swim wording (without diver). Island Image introduces new line of base tees, featuring moisture-transport technology to keep you cool on the hottest days. The fabric face is a beautiful 100% cotton, and the garments have an unsurpassed, comfortable fit. And sure, they're a bit more, but they're OH SO WORTH IT! These specialty items are not shown in our online catalog, so be sure to ask us about them. 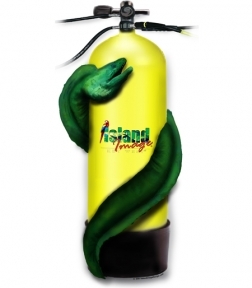 Island Image will be your 'personal assistant' with your trips, events,or student activities. Small business owners have enough on their plate and often do not have enough help with the minutia that goes with dive travel, promotions, events and student activities. So we are most happy to help you with reminders. 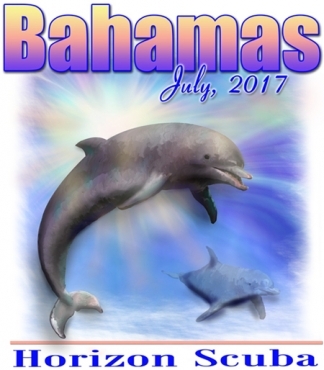 (1) Put you on our reminder calendar to contact you two months out, so you can then plan the shirts for your trip. It gives you time to get sizing, choose a design, then we can do the artwork for you and have to you in time for your pre-trip meeting. (2) It also helps us with new designs. Knowing what you're planning helps us to come up with designs that may work well for YOU. 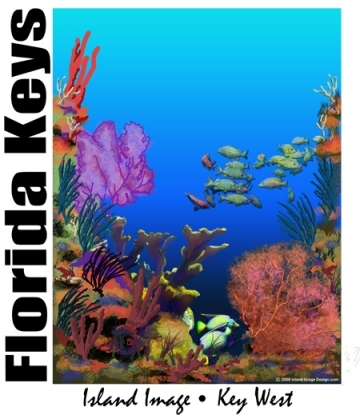 We've enhanced our Caribbean and Florida reef design to add staghorn, new fan coral, grunts, yellowtail, squirrelfish as well as our usual puffer and angelfish. 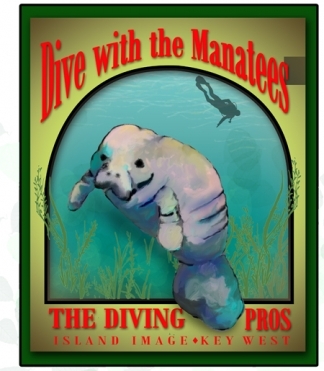 This design is perfect for your Florida dive trips, as well as most Caribbean destinations. Our new series give you yet one more treatment for our popular designs. 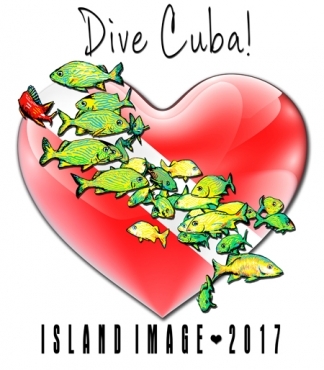 Combining our underwater friends with a classic dive flag, there can be no doubt what your passion is when you or your customers wear this design. 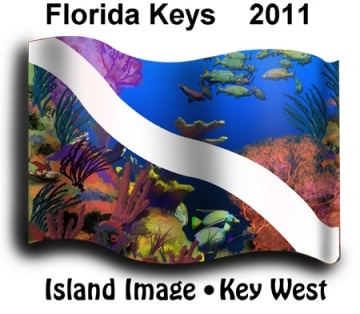 Florida / Caribbean Reef Dive Flag features staghorn, fan coral, angelfish, grunts, yellowtail, squirrel fish and more. 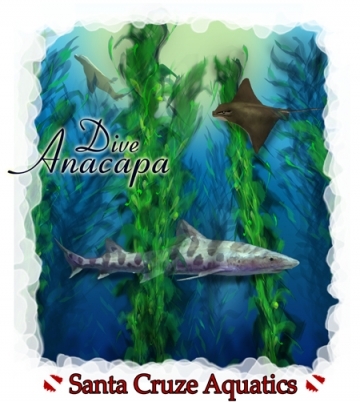 Diving with Great Whites during your dive travels? 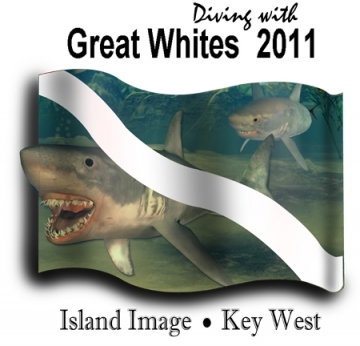 Then you MUST have a Great Whites Dive Flag shirt to go with it. We simply couldn't contain that shark to the confines of the flag! Leopard Shark in Kelp Forest (with California Bat Ray and Seal) . Click to see it HERE in our retail store. 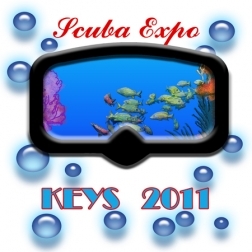 See them at DEMA Las Vegas 17 November - 20 November 2010, along with other West Coast, South Pacific, Caribbean, wreck and tropical designs. Click HERE to see it in our Retail web store. Call us anytime for help and ideas. We're here to help you with your projects, trips, and retail needs. We can always make recommendations for designs and customization to make your shirts something special and unique. SPELL IT OUT! DEFINE YOURSELF! 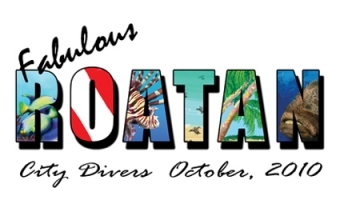 What better way to spell out your next trip, destination, company name or dive sites than to, well....SPELL IT OUT! Our new design allows you to spell out your destination, your company, your trips - whatever you wish, with a choice of designs for each letter. Note: There will be some limitations. Too many letters will not give you the effect you're looking for. Please call us for help with your customized 'Spell It Out' design with YOUR destination and your choice of designs for the lettering. We are only making two available in our retail line: Spell It Out! Fiji Limited Edition Tee and Spell It Out! 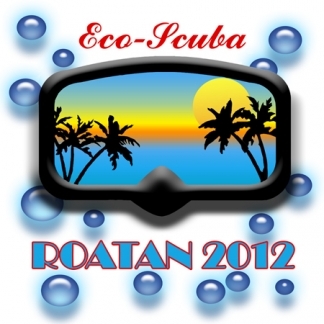 Roatan Limited Edition Tee . However these give you an opportunity to get an idea of the look and detail we can create for you. Because of the time and labor involved in customizing, we are not able to do onesie-twosie fully customized orders with this design. Call us or email us to customize this design for YOU. 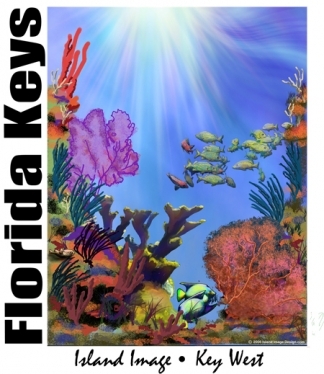 TWO NEW DESIGNS - GREAT NEW REEF LAYOUT WITH A LOT OF SPACE TO GIVE IT YOUR OWN TWIST. The Liveaboard / boat version is every bit as customizable. Please be aware, though, that there could be artwork charges to turn your boat into compatible artwork, if we do not have a suitable vessel on file for your event or trip. 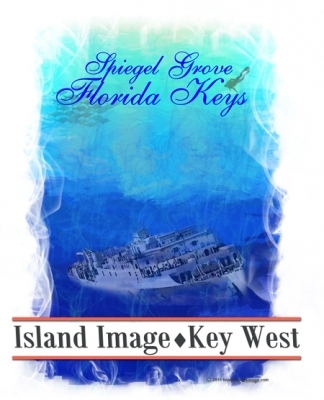 Email us at info@islandimagedesign.com or phone us to see how we can make this, or any of our other designs, YOURS for your trip, event, destination, or staff. BRAND NEW LAYOUTS FOR SUMMER. Now you can REALLY make it your own! 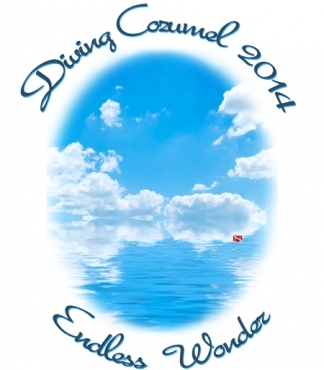 This new design is versatile and works well for destinations, dive travel, or even general travel! The 1960's era vintage dive gear can be removed if you so desire, and we can add a dive flag buoy on the water. 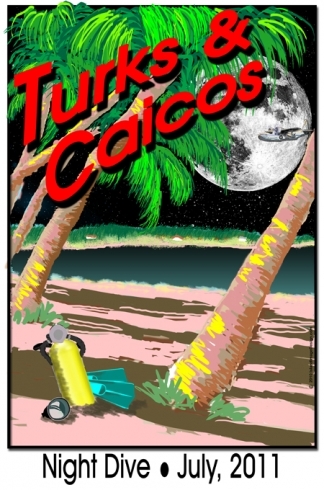 We started with two designs that work well for most any island destination, whether the island has hills such as in the Southern Caribbean, or flatter such as the Keys, Bahamas, Turks and Caicos, Grand Caymans. In the South Pacific you'll find some of each. Add your destination at the top, and your company, group, trip or event at the bottom. Click to see them in our Retail Web Store. 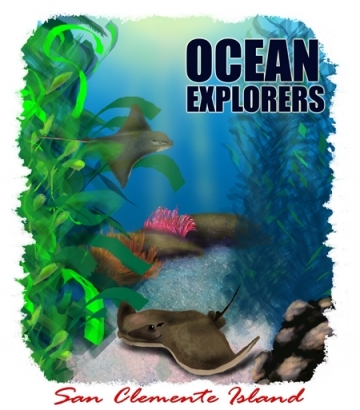 We all love eels - they're gentle, but can be fiercely protective of their home. 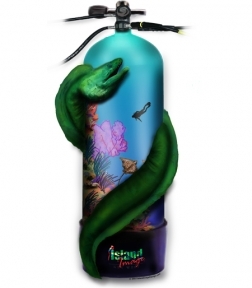 Now our new Green Moray Eel wraps any of our dive tank designs. 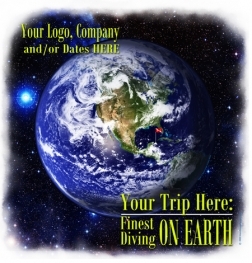 Add your logo, your destination or just your saying to these new designs. It's a great way to wear your dive gear - ALL THE TIME! As with all of our designs, this design is customizable and flexible for your needs! 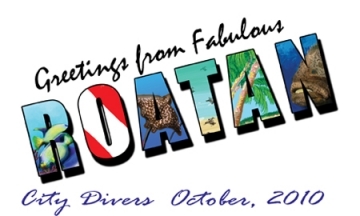 Do you do dive travel? This makes a great trip shirt! 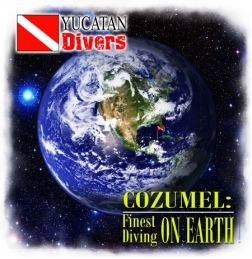 If you're one of the best dive destinations in the world, it's a natural! We offer an Eastern Hemisphere version and a Western Hemisphere version to match most any destination. Want to see what you can do with them? 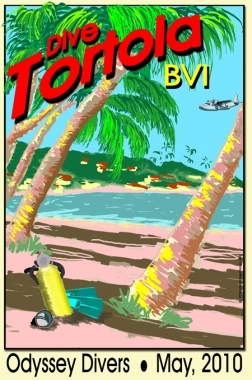 Perfect for destination dive operatons: OR just fill in the blanks! As always, these are customizable for you, your shop, your retail or your trips. 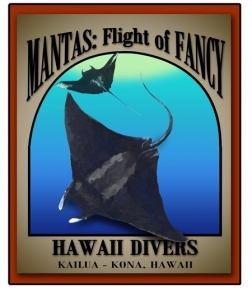 We had many requests for Mantas at DEMA so here they are! NEW! 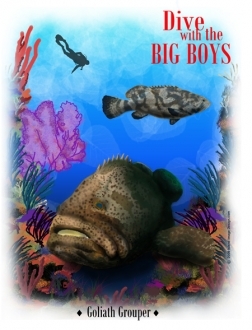 GOLIATH GROUPER DESIGN CAN BE ADDED TO ANY BACKDROP FOR YOU! 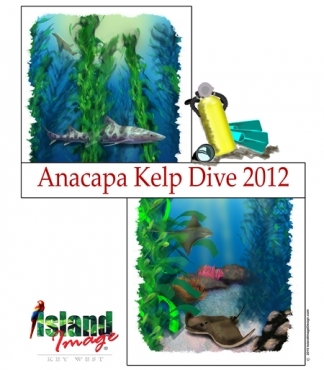 DEMA 09: YOU TALKED, WE LISTENED! You talked, we listened! Keep an eye out for our new designs. 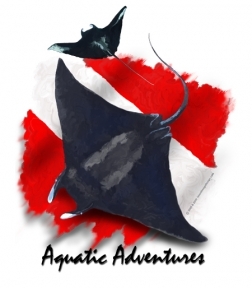 First up, our Manta ray, requested by so many of you at DEMA. This should be available by the end of the week. We also have humpback whales and orcas, as well as a few fun general dive designs, all due out in the next month or so. We really enjoyed putting faces with the names and thank you for the never-ending stream of compliments on our line, and for your orders. As always, we are working hard to deliver for you on time and with the best customer service around. Thank you again, one and all! A last minute addition to our DEMA 2010 line! 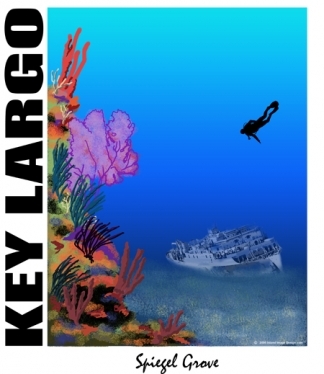 Be sure to stop by booth 2256 and see the new Garibaldi in Kelp Forest design! 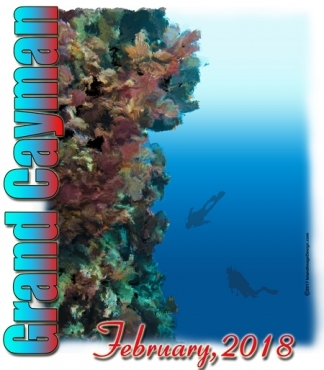 Great for dive shops, dive resorts, educational groups, liveaboards and other charters, it's also a great base for anything you'd like to add! 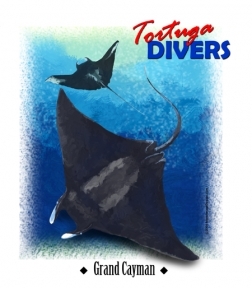 Add a diver, a shark, with or without seal - your choice. 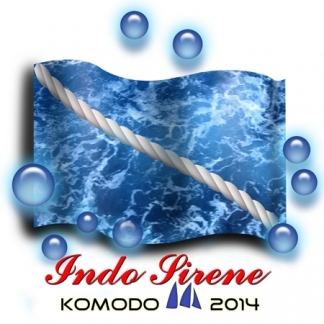 And as always we will customize for you with your trip, destination, boat, group. See it in our web store here. 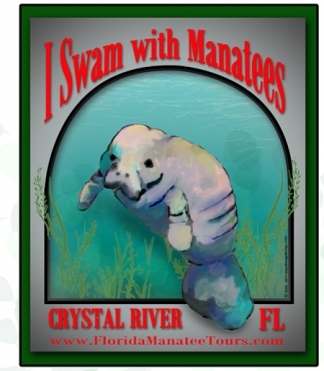 DEMA ORLANDO STARTS NOVEMBER 4 ! 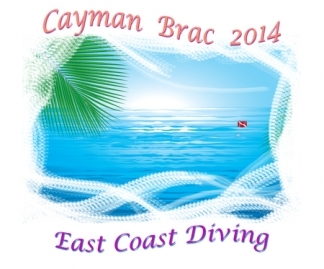 Don't miss DEMA this year and visit us at booth 2256 to see all the newest designs. Let us show you how to increase your income, enhance your image and advertise your business one t-shirt at a time! As usual, we take our entire crew so we will be fielding emails and phone calls from the show floor. Same phone, same email address, same business hours. 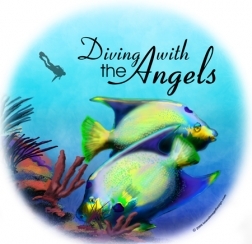 DIVING WITH THE ANGELS - A HEAVENLY DESIGN! 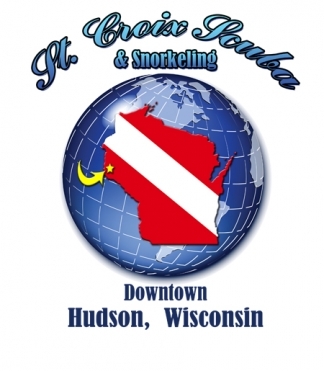 Retailers and dive shops: We'd like to add your link on our Retailers Page. Please email us with the appropriate page URL and we can arrange reciprocal links. Dad likes nothing more than something from the heart....and what says it better than a t-shirt made just for him? There's still time to send one of your favorite pictures of you and your Dad to have it printed on a great tee for summer. 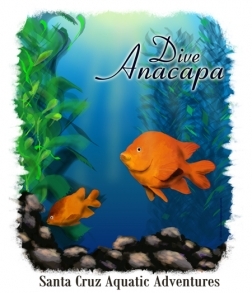 OR if Dad loves diving, fishing, the outdoors or the tropics, one of our designs can be customized just for him. 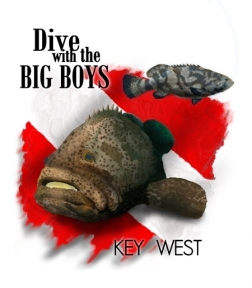 NEW DIVE WITH THE BIG BOYS GOLIATH GROUPER DESIGN IS HERE! 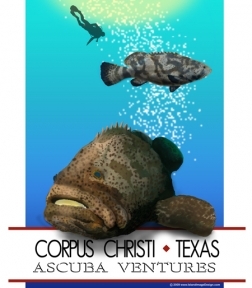 Great for trip shirts, dive destinations with a large Goliath Grouper population, or just to commemorate your favorite dives. As with all our designs, you can customize, putting your information down the left side or under the design. 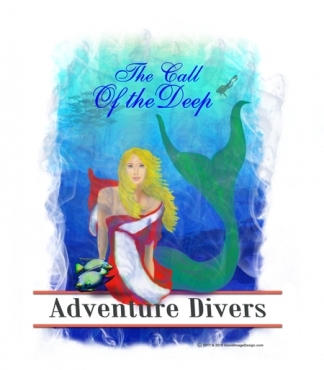 See these new designs under Diving designs today! ANGELS! DO YOU BELIEVE IN THEM? THEY'RE COMING! Indeed, we'll be adding an angelfish design in the next few days. Look for it! 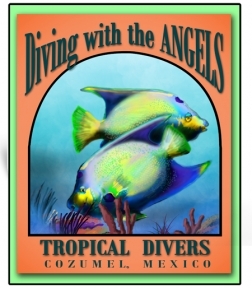 These are queen angels and there's nothing more beautiful than a graceful angelfish, munching away at the reef. Just a reminder that garments imprinted with your artwork or logo don't have to be the standard, everyday T-shirt. Ladies can exhibit style AND your logo or art with any number of great styles. Ask us for recommendations as to how to show your sense of style as well as your logo and company info! Don't forget! We have hundreds of items to choose from so be sure to let us know your ideas and goals! We will scour our many sources to find just the right item for you. 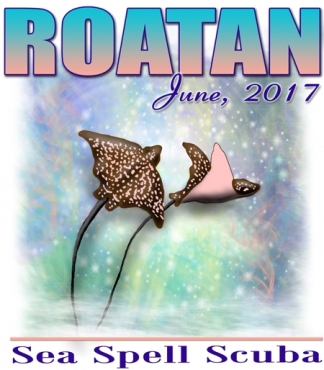 Ask for one of our catalogs and we can send via snail-mail or if you wish we can direct you to an on-line version of our 'blanks' catalog. Just a heads-up! 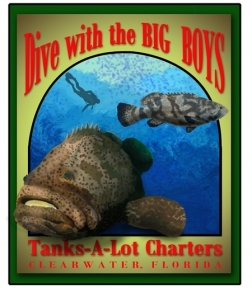 We're working on a new Goliath Grouper design. Look for it in the next week or so! And a personal thought about Lionfish. On CBS News last night, there was a piece highlighting the Lionfish problem in the Atlantic. 'They' seem to be blaming this all on Hurricane Andrew. HUH? This problem is far more than an aquarium dumping into the Atlantic in 1992. It's important that we all be aware of what an invasive species can do to an eco system and discourage owners of exotic pets to find an appropriate home for pets they no longer want, instead of dumping them in the wild. We have Pythons in the Everglades eating all they can eat. 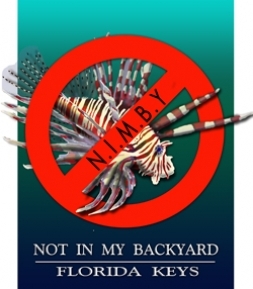 We have Iguanas in the Keys and South Florida ruining gardens, eating native growth and overtaking large areas of land. 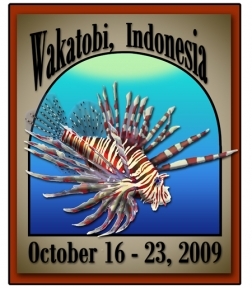 And of course, we have Lionfish and other invasives in the sea. Please support legislation to stop import of exotic species such as these. 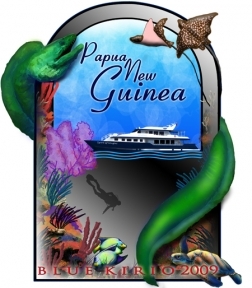 NEW SOUTH PACIFIC DESIGNS PLUS SOMETHING FOR THE ENVIRONMENT! 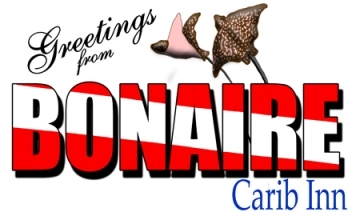 If you are in Caribbean or East Coast US waters, you'll view lionfish differently. 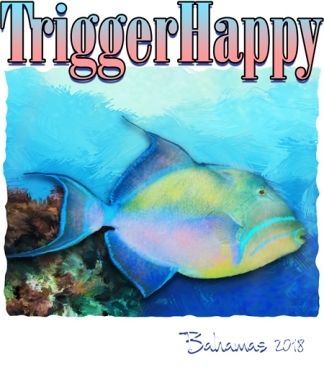 Introduced by aquarium enthusiasts who haven't thought their actions through, they are considered to be invaders and are beginning to decimate our reefs since they have no real natural predators in these waters. 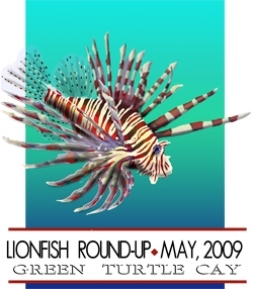 If you're planning a lionfish roundup or a program to deal with these predators, tees are a great fundraiser AND motivator! 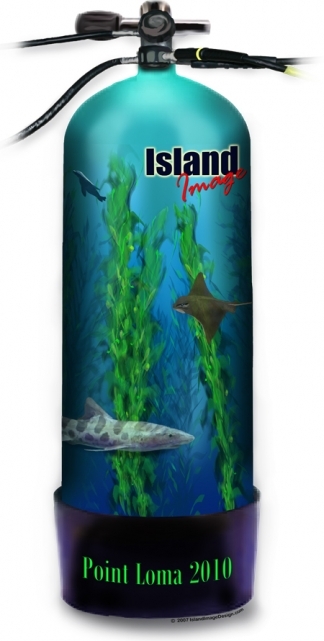 Many of our customers are asking that we add South Pacific marine life to our reef designs so in response to this request, we are currently working on just that. Expect to see these new features in our reef designs, plus several new South Pacific reef fish designs in the next month. 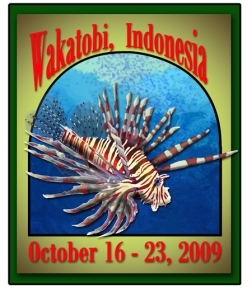 First up is the lionfish, native to the South Pacific and considered an invader in other parts of the world's oceans. 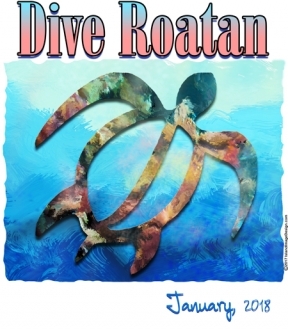 Look for the new designs in the next few days promoting South Pacific diving and this native species, as well as designs promoting awareness that this invasive species can decimate an eco-system if they're in the wrong part of the world. We always welcome ideas and requests from YOU! 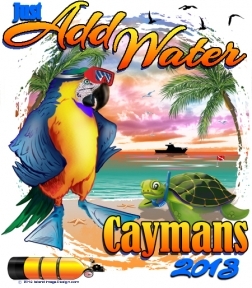 T SHIRTS - THE MOST VERSATILE MARKETING TOOL - Your customers can pay for your advertising! We call them walking billboards. With printed t-shirts, polos, and other imprinted garments, it's important to display not only your logo but eye-catching designs. Thee logo can be on the front left of a shirt, as is traditional, or it is now trendy to drop the logo on the back, centered a few inches under the neckline. Obviously on the later, you'd want to have a great design on the front of the shirt. 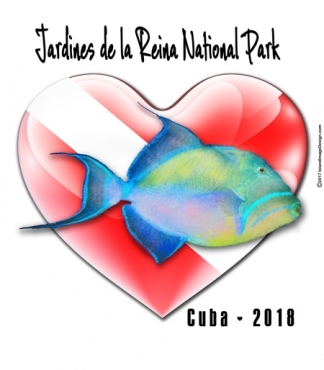 Your guest house, hotel, lodging guests, snorkel or dive trip customers, bar and restaurant customers, tour guests and fishing clients will all want to take home a shirt showing where they've been and what they were doing. Not only do they PAY for the shirt which advertises your business, you make a profit on it as well. Think of it: How many t-shirts do you personally own from previous vacations, cruises or trips? And aren't your favorites well worn? The older they get, the more comfortable they are and....you still remember the experience every time you wear the shirt. If you do not have a tourist-related business, it's still a great way to get your name on the street. Make 'company logo' items available to your employees at a great low price - or even at cost. They'll want to wear them even when they're not working and will probably want to give some to friends and family as well. Again, your name is on the street even during non-business hours. If you're a boutique or other trendy shop or business, fashionable items featuring your name, your product, your artwork, your identity will easily sell at retail and again, you are making a profit as well as gaining another opportunity to put your name out in the world beyond the store walls. AT LAST! THE ADOLPHUS BUSH SR. WRECK HAS IT'S OWN SHIRT! 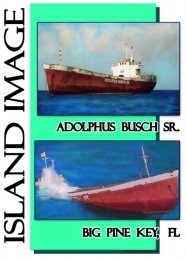 and there's also the full-color Busch design that includes two paintings of the ship - before and during the sinking. Both are a great way to commemorate your dives on this 11 year old wreck! Add your dates, your group, your company to make it your own. NEW VANDENBERG HISTORY SHIRT IS HERE! The new Vandenberg dive tee is here! The design features the original ship launched in the early 40's, the General Harry Taylor, and the General Hoyt S Vandenberg underway (along with battle ribbons). These two depictions are based on US Navy archive photos and have been hand-colored for a bright, authentic look. Detail? We've even added the proper flags! 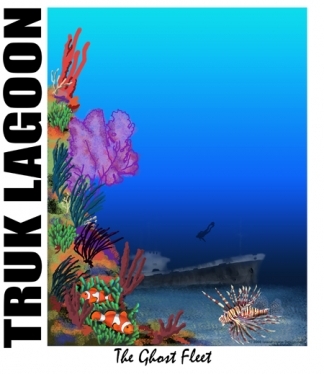 And finally, a painting depicting the sinking from one of our photos taken during the sinking. As always, it's customizable. Put your group, your dates - whatever you wish on the upper-left of the design. Check it out in our web store. 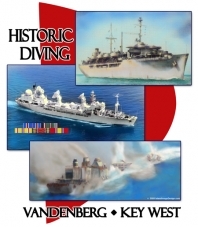 THE VANDENBERG SINKS AND AN ARTIFICIAL REEF IS BORN! 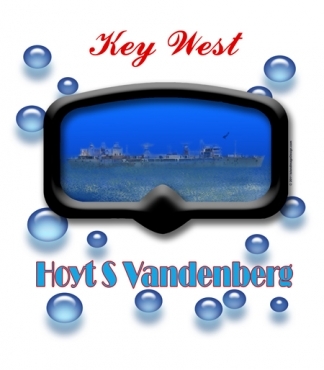 The General Hoyt S.Vandenberg went down in Key West and we were there to photograph and watch it happen. It was most impressive to see a 520' ship sink - all in under 2 minutes! 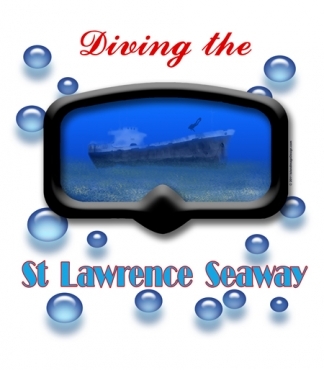 The photos we took will be the basis for a new design depicting the ship in her original state as the Harry Taylor , then as the Hoyt S. Vandenberg and finally, as she sinks to become a fabulous wreck dive and artificial reef. The Vandenberg has been added to our 'World's Best' series and the first two limited edition tees printed were gifts to the friends who graciously hosted us on their yacht for the sinking, Kurt and Elizabeth Ockershausen. Stay tuned for the new Vandenberg design, as well as other new wreck designs!